All homes currently listed for sale in the zip code 92109 as of 04/22/2019 are shown below. You can change the search criteria at any time by pressing the 'Change Search' button below. "JUST REDUCED!!!! MAGNIFICENT & UNIQUE SOARING 2 STORY UNIT WITH UNOBSTRUCTED OCEAN VIEWS, STEPS FROM THE SAND. Ocean views from LR, DR, kitchen, Master BR and bath. Front patio and 2 large side decks, all with ocean views. Walk to restaurants and shops. JUST REMODELED, inside and out. Unparalleled oceanfront property in North Mission Beach with 60' of beachfront. One of the most unique properties on the boardwalk with two-story views from the living room. Too many upgrades to list (see supple"
"Situated in one of PB s most desirable hillside enclaves that borders La Jolla and is 1.2 miles to the ocean, this custom home built in 2009 offers extraordinary ocean, bay, and city views! Meticulously designed, the home enjoys an expansive floor plan, elevator, solar, wine cellar, media room, 3-car garage, pebble tech pool and spa on view side, and multiple patios. Your immediate neighborhood features some of the most beautiful homes in Pacific Beach and is walkable to Kate Sessions Park." "*HOUSE IS GONE. REBUILD HAS BEGUN* Here is your chance to own one of the highly-coveted lots/home ON the Boardwalk, ON the Bay! Being built is a custom 3 story, 4 bed/3.5 bath with 2,171 sq ft of space, designed by renowned architect Tim Golba. Enjoy the quintessential SD beach life in Mission/Pacific Beach with tons of family activities, restaurants, and retail surrounding. Public parking is only a few steps away! **See Attachment**"
"ONE OF A KIND BAY FRONT PENTHOUSE w/PRIVATE ROOFTOP DECK & 360 DEGREE VIEWS of MISSION BAY, PACIFIC OCEAN & MISSION BAY PARK !!! The Exclusive Use SKY-YARD is Rare & Unique on Top of One of the Tallest Buildings in MB & Spans the Entire Rooftop of the Whole Building!!! This Rare Expansive South Mission Bay Penthouse has been Remodeled & Also Boasts Incredible Views From the Living, Dining, Kitchen & Master Bedroom. Water Views from ALL Bedrooms! Secure Building with Elevator for Easy Access"
"Located a few steps from the popular Mission Beach, shops, restaurants and Belmont park, this beautiful home is full of light. A spacious courtyard, great for entertaining and multiple balconies offering ocean views and dazzling night light views, make this a great place to call home or a perfect place to vacation. Some custom features include an elevator, radiant floor heating, electric window coverings, custom tile, Marble countertops, and lit Quartz stone bar counter, recessed lighting, CAT5." "Gorgeous home in South Mission Beach! This turn key property was built in 2010 and features travertine floors, stainless steel appliances, granite counter tops, AC, 4 car parking and solar. Home has a great rental history with $174,771 in gross rents for 2018. The property is also condo mapped giving the new owner the option selling as 2 condos in the future"
"Location Location Location! This home has been remodeled and updated, has a FABULOUS floor plan for a vacation home or multi generations! Great use of space with separation of bedrooms. So much fun to be had here with the spa,steps from the bay, beaches and shops! 2-car garage with an additional parking spot - Yes, 3 valuable spaces. HUGE View deck of ocean, bay, city lights - This is a great property!" "Quintessential California Cottage on a quiet corner of Mission Bay. This wonderful 2 bedroom home on the sand captures the beauty of Mariners Cove from the open living and dining area opening to a wonderfully peaceful deck and fenced patio. Resort living all year long the location in south Mission beach is ideal for the peace and solitude of the bay while just a short walk to the excitement of good food, spirits and the fun of the ocean front. The property has a 2-car garage & 1 open space." "Buyers: How often do you travel? How important is vacation to you? If San Diego is on your vacation bucket list, ensure the perfect San Diego vacation for years to come! San Diego Realty Consultants is currently scheduling a partnership list for common ownership of a large waterfront property for only a fraction of today s market value. This property is already achieving significant income during periods of absence, with a repeat clientele generating income in excess of six figures ann"
"Incredible luxury duplex property in Pacific Beach! These two spacious detached units are fully furnished, currently professionally operated as high-end vacation rentals. 4BR/2BA front home features a private outdoor yard with seating area and sleeps 10 guests; the rear 5BR/3BA home features an amazing rooftop patio and accommodates up to 13 guests. Both units have in-unit laundry, modern finishes, and garages. Great opportunity to live in one and rent the other. ***SELLER FINANCING MAY BE AVAIL"
"Absolutely Stunning Penthouse in South Mission Beach. Ocean Front Living at it's finest with Breathtaking White Water Views & Majestic Sunsets. Enjoy the entire top floor to yourself with a wall of windows facing the beach as does the massive private balcony. Light, bright & completely remodeled which makes it perfect for both owners & vacation renters. Fantastic Boardwalk location close to volleyball/basketball courts & parks. Elevator takes you directly into your unit & extra storage in a 2 ca"
"LA JOLLA SCHOOLS, NEWLY RENOVATED, PEEK OCEAN VIEWS! Contemporary coastal living in the highly sought-after neighborhood of Bird Rock. This charming single-level home is newly-renovated, highlighting peek coastal views; amazing California sunsets from the front porch, kitchen, living room & backyard. This home is perfectly located for a young family or beach goers/surf-obsessed: only 600 ft from Bird Rock Elementary School, 6 blocks to Tourmaline Beach, 3 blocks to grocery stores, restaurants & "
"Rare opportunity to own a beautiful & upgraded home in north Pacific Beach w/ a Casita. Both homes have their own 2 spacious car garages & amazing views to the ocean, bay & city. Main home has a fantastic floor plan w/ high end upgrades, 2 master suite upstairs w/ a large loft leading to a balcony, downstairs 2 large bedrooms , 1 full large bathroom, gourmet kitchen, dinning room & living room areas. Casita in the back has a huge deck also w/ stunning views. Lots of natural lights , an ideal inv"
"Large South-facing condo steps to the beach! This turn-key 4 bed/3 full bath/ 2 half bath home has a large ground level patio with 1 bedrooms on the 1st floor w/ 1.5 baths, 2 bedrooms and 2 full baths on the 2nd level and large living room, dining area, chefs kitchen, half bath and laundry room on the 3rd level. Beautiful details from floor to ceiling include travertine floors, stainless appliances, elevator, solar, central air, in-ceiling speakers, and large 3 car garage. 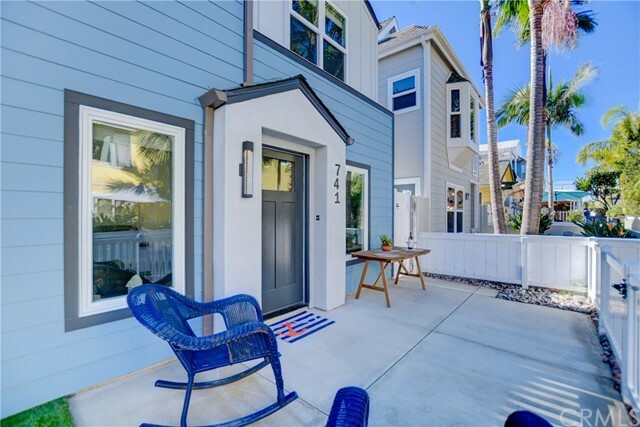 $123k 2018 rental i"
"Beautifully updated contemporary single family home on a great court in North Mission Beach. This remodeled home features an open floor plan with a gourmet kitchen complete with stainless appliances and center island. The kitchen seamlessly flows into the welcoming living room which is illuminated by floor to ceiling glass doors transitioning to the spacious and serene south facing patio. A great location that is steps to Mission Bay or the Pacific Ocean make this a great home to live in or vaca"
"Gorgeous and completely rebuilt Custom Beach Bungalow in North Mission Beach. Located just 7 lots from the beach, including a two car garage, lovely patio for entertaining, and attention to every detail. Enjoy coastal and beach living in one of the best locations Southern California has to offer." "Just in time for you to live at the beach this summer! Located in the highly desirable flats of North PB, this spacious home has an exceptionally laid out floorplan with high ceilings, oak & bamboo floors & lots & of natural light. Dual living spaces, one on the 1st floor & one on the 2nd floor & a master suite on each floor as well. An oversized kitchen is great for entertaining or family time & the large backyard with gazebo & built in bbq is screaming for you to enjoy the sunny PB summers. Se"